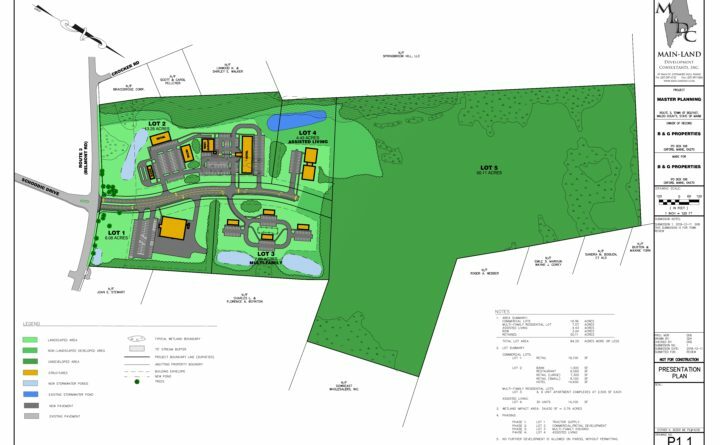 Master plan for the Bahre property off Route 3 in Belfast. Tractor Supply Co., a national retail chain that sells a variety of agricultural and livestock supplies along with tools and workwear, may be locating a store in Belfast. This week, the city’s planning board received a master plan submitted by owners of the 84-acre Bahre property on Route 3 near Crocker Road. It details how they would like to develop part of that parcel. Tractor Supply, which has 16 stores in Maine, would like to buy a portion of the property, Belfast City Planner Wayne Marshall said Thursday. Other, nonspecific plans for the lot include the potential to one day develop a smaller retail area, a restaurant, a hotel, multifamily housing and senior housing. Even with all of that, the whole property would still not be completely developed. That’s because there’s something unique about the Bahre parcel. Since 2007, that particular property is the only place in the city that is zoned to develop a big-box store, or a retail store larger than 75,000 square feet. When the ordinance was adopted, it happened after a long period of discussion and — perhaps no surprise in Belfast — strife about the future of development here. In 2000, after Walmart expressed an interest in building a supercenter on Route 3, some residents protested the plans and convinced the council to hold a referendum on the issue. The referendum limited the size of retail stores to 75,000 square feet and effectively forced Walmart, and other large retailers, out of town. This move created a bitter divide among residents, a rift that has not been wholly healed and which often gets brought up at other times of conflict in the city. In fact, one aspect of the fight over Walmart became important in the current discussion over whether Belfast is the right place for a large, land-based salmon farm. After the referendum passed to limit the size of retail stores, angry residents who wanted large stores petitioned for another referendum to change the zoning to permit a 200,000-square-foot shopping center on the city’s east side. That 2004 referendum passed but prompted a second vote that changed the city charter to eliminate the provision that allowed land-use decisions to be decided by referendum. And that resulted in the council regaining the authority to unilaterally change the zoning ordinance, an authority that councilors exercised this April when they voted to approve changes that would allow Nordic Aquafarms to advance to the next stages of their fish farm project. But it is an authority that has not gone unchallenged. Salmon farm opponents and neighbors Donna Broderick and Ellie Daniels are suing the city, alleging that municipal officials did not follow the proper process in making zoning changes that allowed the project to move forward. Back in 2007, after Lowe’s and Walmart showed interest in building large retail stores in Belfast, city officials hammered out what they refer to as “the Great Compromise,” Marshall said, to allow big-box development on the Route 3 parcel. But perhaps because of global economic shifts caused by the Great Recession and the rise of online shopping, there has not been a move to develop that lot, at least not until now. “This is the first real application on that property since that code was developed in 2007,” Marshall said, adding that the master plan does not include any big-box store developments. Tractor Supply stores are typically the same size as the Aubuchon Hardware store in Belfast, he said, and would be around 22,000 to 24,000 square feet. There would also be an outdoor display component of about 7,500 square feet. Marshall said he expects Tractor Supply to submit an application to the city within a few days, and there will be a public hearing on the master plan for the property and the Tractor Supply application at an upcoming sketch-plan review meeting scheduled for 6 p.m. Jan. 8, at a location to be determined. Because this parcel is subject to contract rezoning, it will require approval from the Belfast City Council as well as the Belfast Planning Board. It will be a long process, but social media pages seemed to ignite about the proposal soon after the planning board learned about it, with some residents expressing excitement about the store coming to town and others much more dubious about it. When Marshall was asked if he expects the Route 3 development to be controversial, as Nordic Aquafarms’ proposed land-based salmon farm on the other side of the city has been over the past year, he answered diplomatically.